Running in the rain can be exhilarating. It can also be a miserable experience—depending on your attitude, your sense of adventure, and the gear that you choose. In order to help you get outside and enjoy your workout, regardless of the weather, we’ve put together a list of important tips for running in the rain. Once you know how to run in the rain comfortably and safely, you’ll probably find that it can be a whole lot of fun! The right pair of shoes is fundamental to any run. 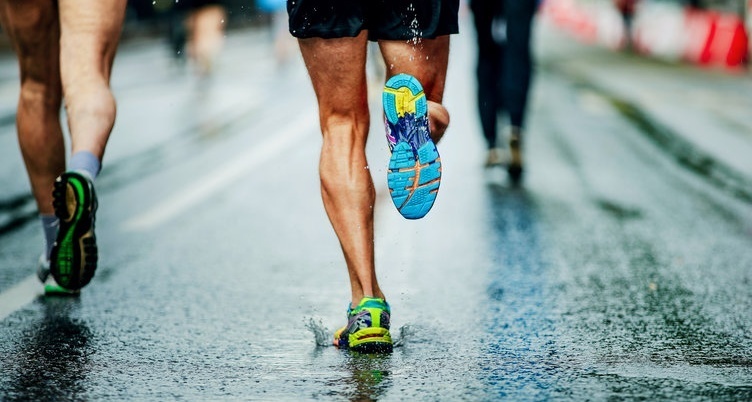 Rainy weather makes choosing appropriate shoes even more important, since it’s easy to slip while running in the rain if the tread of your shoes is worn. Smooth tread usually means its time for a new pair of shoes anyway, so be sure your kicks are in good shape, with plenty of traction. Pick thin socks, as they’ll absorb less water than a cushioned pair. Your shoes and socks will get wet no matter what—so don’t be discouraged. To dry damp shoes post-run, stuff them with crumpled newspaper and let them air dry. Layering is the key to dressing properly for running in the rain. Wear a base layer made of tech fabric that will wick moisture from your body and remain lightweight when soaking wet. If it’s cool enough to need a jacket or vest, choose one that is wind and water resistant, but not waterproof. A waterproof jacket will keep rain from getting in, but it will also trap moisture and warmth, causing you to overheat. A hat or visor with a brim will help keep the rain out of your eyes. Help drivers see you and steer clear when you’re running in the rain. Wear neon colors, clothes with reflective strips, or even a blinking light strapped to your body. A headlamp or a small flashlight will also help others see you, while lighting the way along your running route. If it’s a real soaker, you’re wise to avoid slippery, muddy trails. Your visibility is usually compromised when running in the rain, so watch your step wherever you go. Note that painted stripes on roadways become slick when wet. An all-weather outdoor track can be an ideal venue for your rainy run. Do you run with electronics? Keep them safe from rain (and sweat) in a waterproof case. Or, opt for a far less expensive solution and simply stash them in a sealed Ziploc bag. You still need to hydrate when running in the rain. If you’re soaked by a storm, you may not realize that you’re sweating and losing valuable electrolytes. Keep a sports drink or water handy and be sure to drink up. 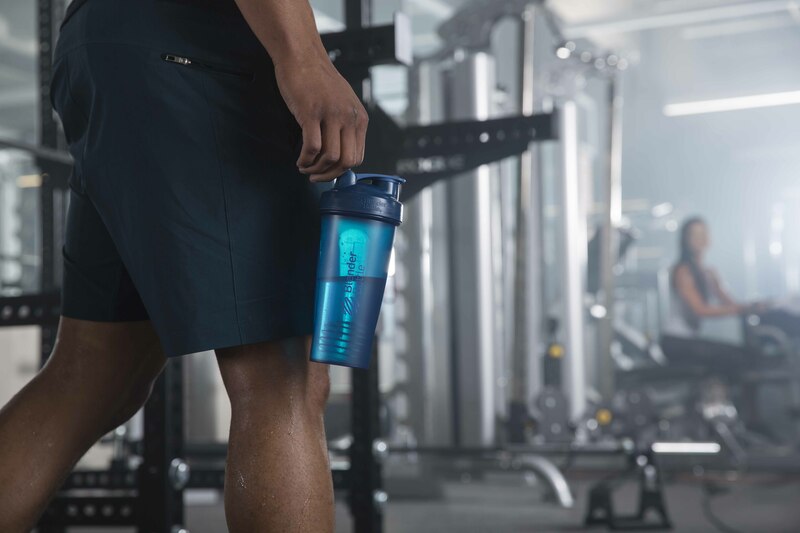 The BlenderBottle® SportMixer® has a textured grip to help you hold on tight, making it a great choice for those wet weather runs. A lot of people struggle to leave home if it’s sprinkling, yet don’t mind being caught in a downpour once their run is underway. This is mostly a mental block; it’s understandably hard to head out the door into inclement weather. If you can train yourself to run regardless of the conditions, you’ll build up your toughness for the times you need it most (for example, on a cold and rainy race morning). That said, a thunderstorm should thwart your running plans. While running in the rain is safe, running near lightning is a different story. If thunder and lightning is in the forecast, it’s a good day to run on a treadmill indoors. Have a funny story about running in bad weather? We’d love to hear it! Share yours in the comments below.